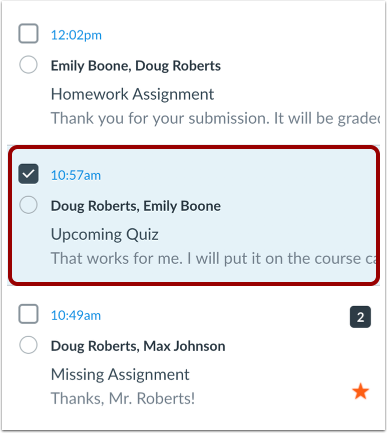 You can delete individual messages within a conversation in Canvas. Hover over the timestamp of the message you want to delete to view more options. Select the Delete link. Note: You can only select one message to delete at a time. Click the OK button to delete the message. Note: You can only delete your copy of the message. You cannot delete the message for all recipients. Previous Topic:How do I delete a conversation as an instructor? Next Topic:How do I archive a conversation as an instructor? Table of Contents > Conversations > How do I delete a message from a conversation as an instructor?